HCM City-based R2D Food Technology Science JSC has won the first prize of VND50 million (US$2,202) at the third Agricultural Start-up Competition with its smokeless charcoal. The HCM City-based R2D Food Technology Science JSC receives the first prize at the third Agricultural Start-up Competition for its smokeless charcoal. Produced from agricultural by-products such as coconut shells, the charcoal is smokeless, odourless, completely without chemicals and does not explode when fired. Le Thi Hien, founder and director of the company, said it sells 50 tonnes of the charcoal every month in the domestic market and abroad. It is focused on boosting exports, especially to the US, EU and Japan, as well as developing its brand in the domestic market, she added. The second prize worth VND20 million each was shared by Nguyen Van Tuan of Bac Can for his Thanh Ngan multi-functional agricultural machinery and Tran Phuc Hau of Ben Tre for a micro-biological product from sugarcane bagasse powder for intensive shrimp culture. 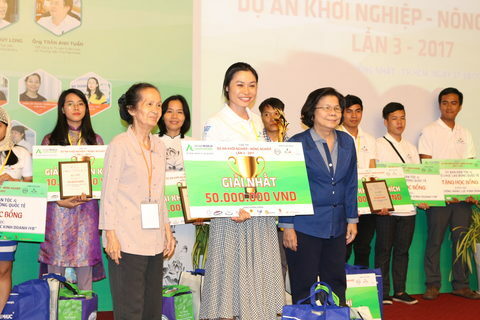 Two third prizes worth VND15 million each were awarded to Nguyen Thi Bich Ngoc (Thai Nguyen) for her organic tea and Lai Thi Bich (Gia Lai) for her five-coloured pepper. Five others received consolation prizes for an agricultural and medicinal material value chain; an anti-mosquito biological incense; a cajuput-flavoured honey; an eco-nursery; and pre-mixed ingredients for Hue beef noodle soup. The winners also received scholarships for training in Thailand and studying the "One Tambon One Product" model. Organised by the Business Study and Assistance Centre; Innovation, Startup and Entrepreneurship Club (SKC); Trung Nguyen Group and others, the competition attracted 117 entries, with 30 entering the final round. According to the jury, the contest recognised innovations in production and trading. Often in Viet Nam, innovators do not pay much attention to commercialising and monetising their products, something contests like this can help address, the judges added.